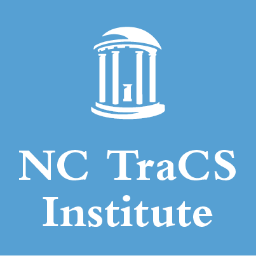 The North Carolina Translational and Clinical Sciences (NC TraCS) Institute at UNC-Chapel Hill is one of 60 medical research institutions working together as a national consortium to improve the way biomedical research is conducted across the country. The consortium, funded through the NIH Clinical and Translational Science Awards (CTSA), shares a common vision to reduce the time it takes for laboratory discoveries to become treatments for patients, and to engage communities in clinical research efforts. It also is fulfilling the critical need to train a new generation of clinical researchers. RENCI Director Stan Ahalt directs the NC TraCS Biomedical Informatics team and RENCI Deputy Director Ashok Krishnamurthy serves as the team’s associate director. The BMI team offers numerous services geared toward improving the feasibility and efficiency of research. Core activities include the Carolina Data Warehouse, which now includes a Research Portal that serves as a gateway for investigators to conduct searches and store the transaction results for subsequent analysis and use. Core members also manage the Data Management Services Initiative, the Bioinformatics Education Initiative and the Clinical Research Management System. REACH NC: The Research, Engagement and Capabilities Hub of North Carolina (REACH NC) is an award-winning Web portal that helps researchers identify potential collaborators, university assets, and resources. REACH NC increases transparency of and access to researchers and university resources across the state. RENCI developed the prototype REACH NC system with support from the UNC system. The current portal contains over 18,000 profiles representing experts from 17 UNC system universities, Duke University, the North Carolina Research Campus in Kannapolis, and the Research Triangle Institute International. It is constantly evolving and adding new data and institutions. The Agent Based Colorectal Cancer Screening (CRC) Model project will enhance an existing colorectal cancer screening model to add new levels of dynamism. The new model will also be able to take advantage of a variety of emerging population and medical data sources. The model uses historical data to analyze the potential impacts of health policies being considered by public health officials. RENCI works with the UNC School of Public Health, the Research Triangle Institute International (RTI International) and other groups as needed to understand, document and extend the model. The work involves evaluating agent-based modeling environments, analysis of available data sources, and software development and verification to extend the model to fulfill research objectives. The Practice Based Research Network (PBRN) project aims to prototype a networked group of medical practices that are involved in meaningful use programs and clinical research. The research aspects of the system will facilitate clinical trials recruitment and quality improvement through evidence-based population health. The initial prototype will focus on a small number of medical practices in North Carolina’s Lenoir county that are already engaged in a hypertension care quality measurement project. RENCI provides informatics and research IT consultation services to the project. The Secure Medical Workspace (SMW) is a data security infrastructure that allows researchers to work with sensitive clinical health care data without fear of its accidental release to unauthorized users. In association with UNC Chapel Hill Information Technology Services, the School of Information and Library Science, and other UNC collaborators, RENCI developed an initial architectural prototype of the system which was subsequently adopted at UNC. SMW is currently used for Institutional Review Board security level III studies as well as for other UNC Chapel Hill projects that need to make use of highly sensitive data for research purposes.